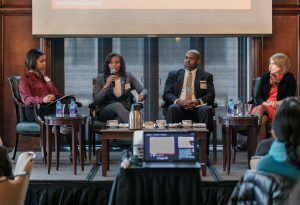 The W. Clement and Jessie V. Stone Foundation and the Forefront Education Group co-hosted a discussion around the University of Chicago Consortium’s report, Social, Emotional and Academic Development: Research Implications for Educators. Elaine Allensworth, the Consortium’s Lewis Sebring Director, provided highlights of the report. Brandis Friedman, correspondent and host of WTTW’s Chicago Tonight, moderated a panel that included Allensworth, LaTanya McDade, CPS Chief Education Officer, and Desmond Blackburn, CEO of New Teacher Center. Research has long told us that social, emotional learning (SEL) skills are critical to success in school and life for all students. And yet, there are still gaps between what we know and what we do for our children and students. On March 21st, a thoughtful panel of experts offered evidence of progress – 447 CPS schools prioritized supportive school environments, earning the supportive school certification — and strategies for making the promise of SEL a reality for all. change the “hearts and minds” of adults working with students in the education system so we are always working towards the success of the whole child, and not only test scores. The W. Clement and Jessie V. Stone Foundation is honored to work with grantees across its portfolios – from early childhood, K-12 education, and youth development – who understand how learning happens, and who work toward building systems that support the whole child and the whole teacher.